It is at this point that the outer layers of the star expand; however this time they are lost - expelled in the form of a planetary nebula. The end result of the thermal pulsing from the helium and hydrogen shell burning is a planetary nebula - like this image of the Ring nebula. The remnant carbon core cools and contracts to form a White Dwarf. The star at the center of the Ring nebula (above) is a white dwarf. Interestingly, there is a limit to how big a White Dwarf can be. The maximum mass a White Dwarf (WD) can have is 1.44 Solar masses. This is called the Chandrasekhar limit - named after Subrahmanyan Chandrasekhar, the astronomer who discovered this limit. White dwarfs will eventually cool to the point to where they will no longer be visible. They will become Black Dwarfs. There are no known black dwarfs indicating this cool-off period can take millions of years. If a white dwarf star is a part of a binary star system, some interesting things can happen. 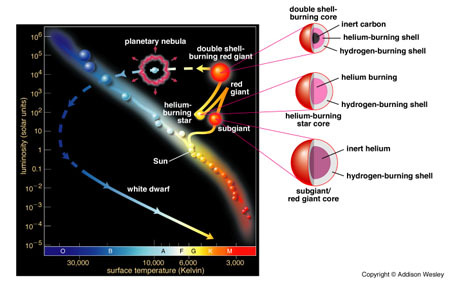 (Image credit: Brooks/Cole Thomson Learning) Because the white dwarf is pretty massive (the mass of the Sun in an object the diameter of Earth), the atmosphere of the companion star can be accreted onto the star. This can only happen when the companion star enters its own red giant phase. Once this happens, material is pulled from the companion to the white dwarf. If a thin layer of material collects in an accretion disk around the white dwarf - dense enough to initiate fusion - then the material will be explosive ejecting a thin hydrogen shell. The white dwarf remains to collect more material (the process repeats itself). However, if material collects rapidly enough on the white dwarf, the mass of the white dwarf can exceed the Chandrasekhar limit. If this happens, there is only once choice: a complete annihilation of the white dwarf and the accreted material. What is unique about a Type 1a supernova is that is occurs just past the Chandrasekhar limit of the white dwarf. As such, the luminosity is standard and can be used an a distance ruler to distant galaxies - just like Cepheid variables are used to measure distance to closer objects.